Booth Theatre, New York City, through March 25, 2012. Jon Robin Baitz’s very fine play “Other Desert Cities,” which played a sold-out run at Lincoln Center’s Mitzi Newhouse Theater in the spring, has re-opened on Broadway. Although there are two new cast members in crucial roles, Joe Mantello’s excellent production is substantially the same as before, and my respect and admiration for the play hasn’t changed at all since I reviewed it before (see here). So I will only add a few additional thoughts about the script and about the performances. The play is set in Palm Springs at the deluxe ranch home of Lyman and Polly Wyeth, former Hollywood players and close friends of Ronald and Nancy Reagan who are celebrating Christmas with their super-talented children – TV producer Trip and writer Brooke – and Polly’s sister and former screenplay collaborator Silda, who’s fresh from rehab. The action of the play pivots on the reaction of her parents to Brooke’s latest book, a memoir spilling the beans about the family’s painful past. Baitz is a master at portraying characters like this, high-functioning literate white Americans, their family dynamics, and their cultural conflicts (political, moral, generational). Seeing the play again, I found myself pondering the meaning of the title. Brooke and Trip casually refer to an actual sign along the highway running east from Los Angeles that directs drivers either to Palm Springs or to “Other Desert Cities.” Palm Springs so dominates that particular California landscape that neighboring towns nearby become nameless others – not unlike the way Brooke treats her own personal history as if it is synonymous with her family’s story, with her in the center and the others as bit players. She’s quite oblivious, until circumstances force her to recognize it, to the reality that other people have their own narratives that may contradict hers or reveal truths and complexities she’s never considered. And without pounding the audience over the head with it, Baitz clearly means for us to consider those other desert cities in the Middle East where American forces have spent the last decade trying to impose a narrative in some ways entirely at odds with the history and culture of Afghanistan and Iraq. We think we know, but we don’t. The light-handed yet steady way that Baitz places his family dramas in a political context is a big part of what makes him one of our best contemporary playwrights. 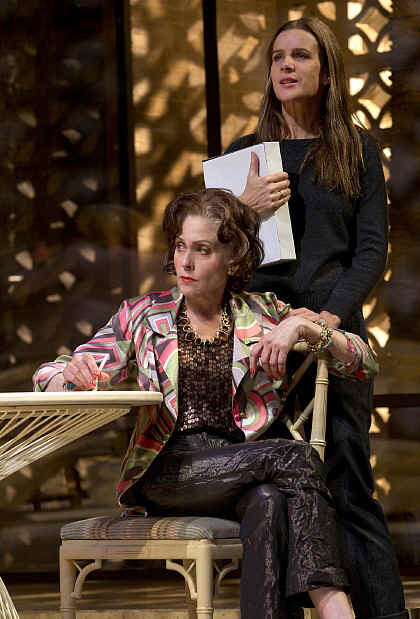 I was eager to see the play on Broadway because Rachel Griffiths (above, far left), an actress I admired very much on “Six Feet Under,” replaced Elizabeth Marvel in the central role of Brooke, and the ever-appealing Judith Light (below) is now appearing as Silda, the role Linda Lavin played in the Lincoln Center production. My honest response to the Broadway production is one that I imagine is irritating and not especially helpful to people who’ve never seen the play before – which is that the new cast members aren’t as good. It’s not that they’re terrible. They give honest, worthy performances. But Marvel’s deep, compelling, and theatrical version of Brooke let us see many shades of her character – her woundedness, her depression, her passive-aggressive self-centeredness -- that don’t show up in Griffiths’ blander, safer rendition. Light is also way toned-down compared to Lavin, who brought down the house with almost every line she uttered. Without her over-the-top entertaining quality, it’s a little hard to understand the sway that Silda has held over Brooke. And Light’s bad dye job, however well-suited to her character, is so outlandish that it’s all you can think about watching her. Rest assured that none of these quibbles affects the overall impact of the show. The returning actors have only gotten better and stronger. Stacy Keach as Lyman has the tricky task of playing a stolid man who’s spent his whole life being diplomatic and not letting his emotions show much, which could get static and dull but never does. Stockard Channing plays Polly as a controlling, unfiltered, flinty mother you’d love to hate but you can’t really because she forces you to experience the vulnerability and love underneath that lacquered mask. And Thomas Sadowski has probably benefited the most from the Broadway transfer, because now the cast works much more as an ensemble, and his Trip emerges as a strong, active truthteller in no danger of being relegated to the sidelines of the Brooke-vs.-Polly showdown.